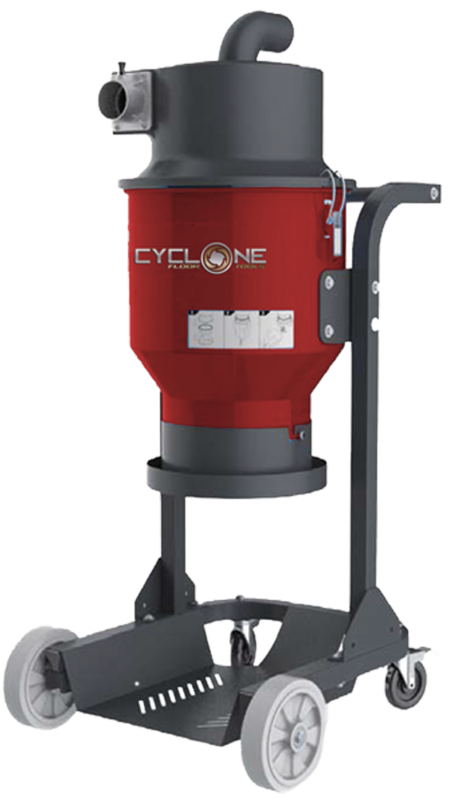 When it comes to dust extraction, the CYCLONE principle can separate more than 90% of dust, reducing maintenance and improving reliability of the machine. 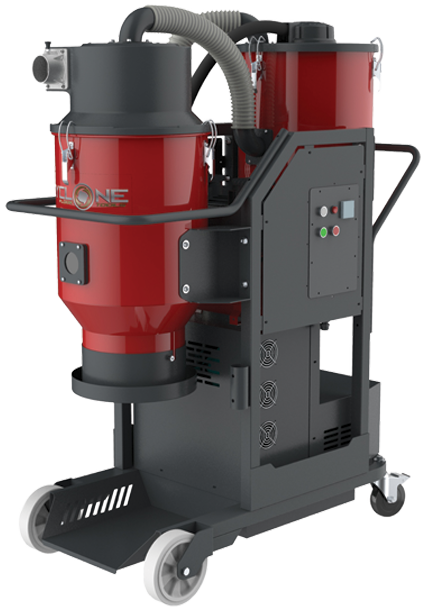 CFT-S When large amount of dust produced during the grinding, it is advisable to use a pre separator. 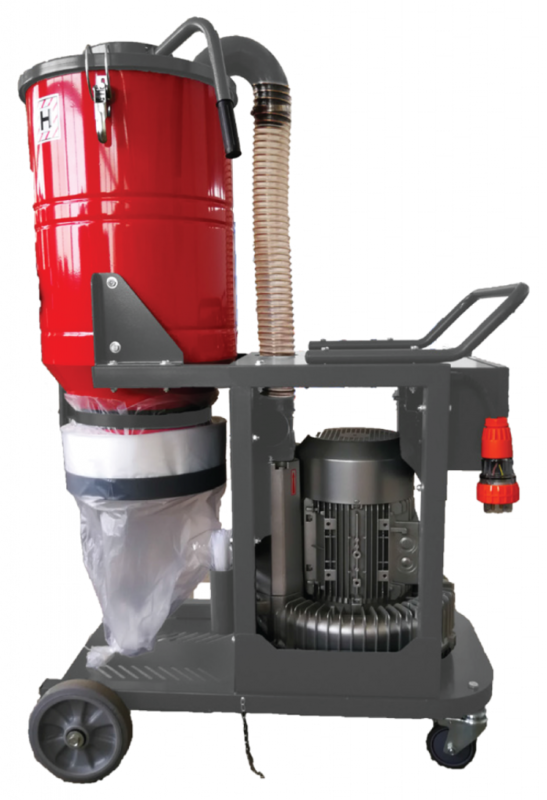 Our CFT-60S separator can work with many different vacuum cleaners. Filtering more than 98% dust, stops more dust entering into the vacuum cleaner, lengthening the vacuums working time, and protects the vacuum filters to extend their life time. Allows connection to many different vacums. Helps lengthen your vacuum’s working life. Compact design, for more flexibility. 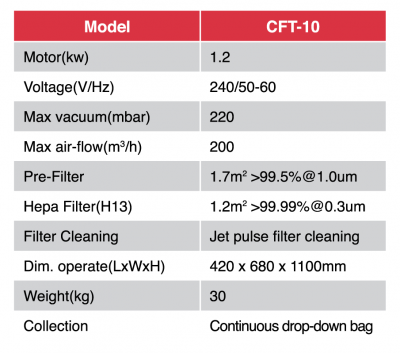 CFT-10 is equipped with a conical pre-filter and one H13 HEPA filter. The main filter having 1.7 m filter surface area. Each of the HEPA filters is independently tested and certified . CFT-10 can separate the fine dust with efficiency >99.99%@0.3μm, ensuring your work space is a clean and safe environment. CFT-10 is recommended for small grinders and hand held power tools. 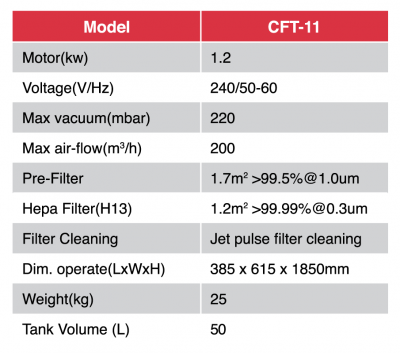 CFT-11 is equipped with a conical pre-filter and one H13 HEPA filter. The main filter having 1.7 m filter surface area. Each of the HEPA filters is independently tested and certified . CFT-11 can separate the fine dust with efficiency >99.99%@0.3μm, ensuring your work space is a clean and safe environment. CFT-11 is recommended for small grinders and hand held power tools. dust with efficiency of ＞ 99.99%@0.3μm., which meets the new silica requirements. 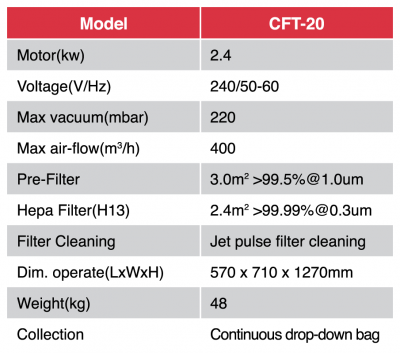 CFT-202 is a HEPA WET & DRY VACUUM . With 3 large Ametek motors, you can have one, two or three motors engaged at any time. 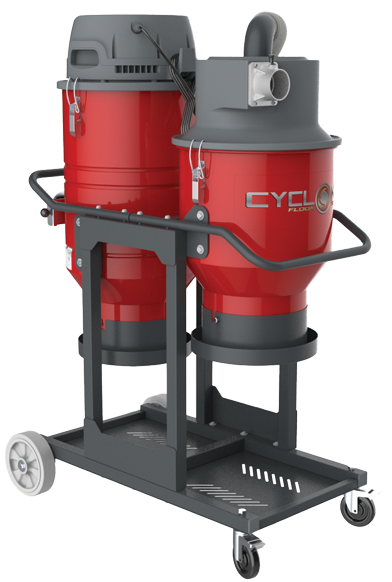 The CFT-202 has plenty power to be connected to any small to large size grinders, scarifies, shot blasters to extract freshly cut, friable concrete dust. Certified HEPA filtration to 99.99% @ 0.3 microns to guarantee that the vacuum exhaust is absolutely dust-free. CFT-202 is supplied with a complete tool kit, including hose, wand and floor tools. CFT-34 is a HEPA concrete dust extractor . 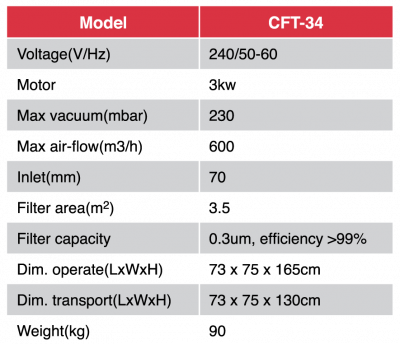 With 3 large Ametek motors, CFT-34 has plenty power to be connected to any mid or larger size grinders, scarifiers, shot blasters to extract freshly cut, friable concrete dust. Certified HEPA filtration to 99.99% @ 0.3 microns to guarantee that the vacuum exhaust is absolutely dust-free. CFT-34 is supplied with a complete tool kit, including hose, wand and floor tools. Allows for a 22m continuous bagging system, which ensures quick and dust-free bag changes. Compact vertical unit, which is easy to maneuver and transport. 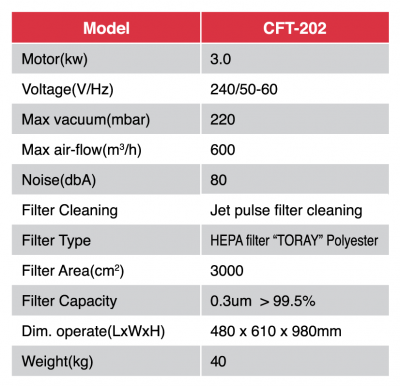 The CFT-34S has 2 stage filtering, imported polyester fiber PTFE coated HEPA filter, allows continuous working conditions. With 3 large Ametek motors, you can have one, two or three motors engaged at any time. 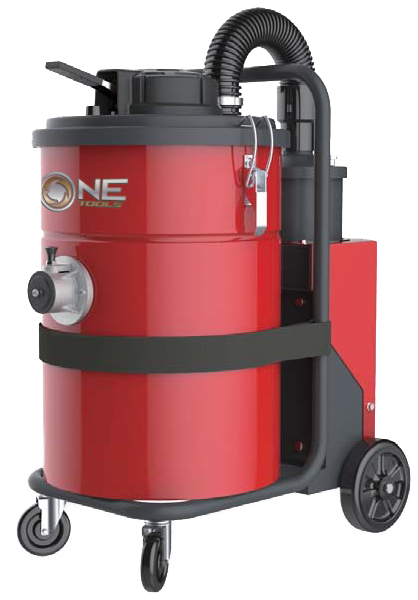 Being compact in size, but with large dust capacity it is perfect for the floor grinding and polishing industry. Imported polyester fiber PTFE coated HEPA filter, low pressure loss, high filter efficiency. Three Ameretek motors, for independent on/off controlling. Allows for a LONGOPAC continuous bagging system, which ensures quick and dust-free bag changes. 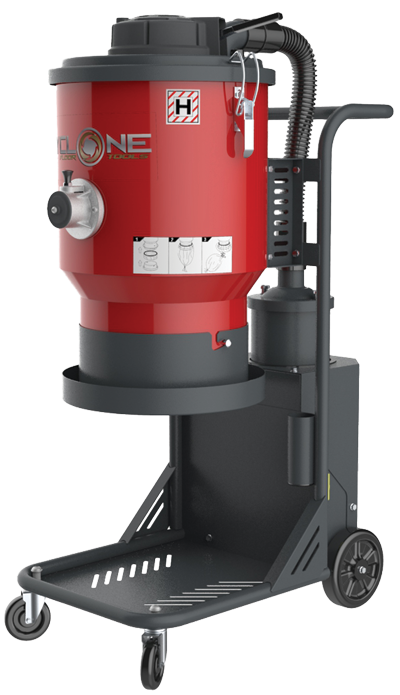 CFT-55 Series Is a smaller 3-phase dust extractor. 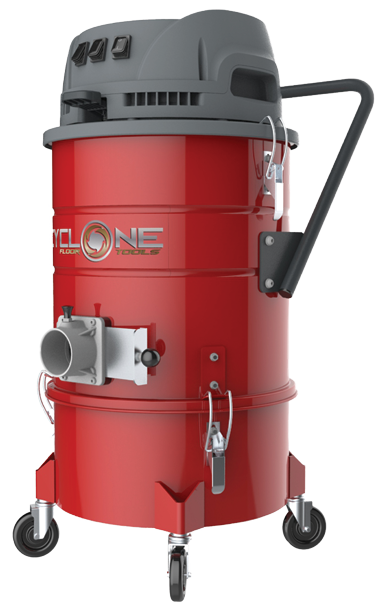 Fitted with a world-class quality turbine motor which provides up to 530m3/h of high suction rate to all sized concrete grinders, even over a 24 hour period of non-stop operation. 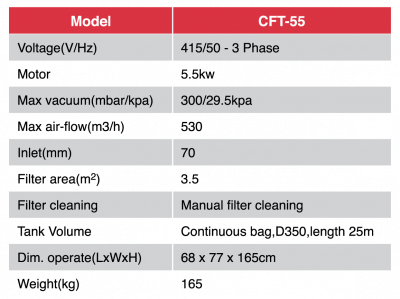 The CFT-55 uses a manual ‘reversed-air cleaning’ system to clean the filter, improving filter life and vacuum efficiency. 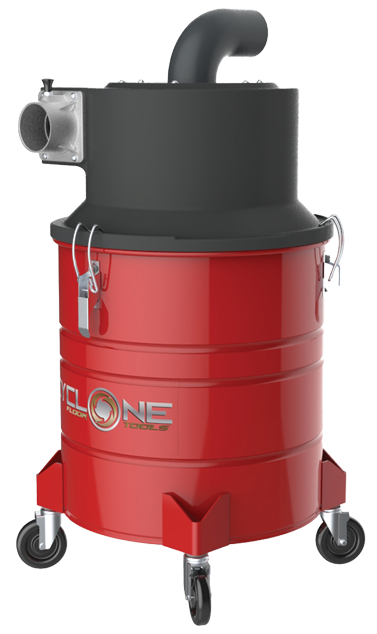 The CYCLONE principle industrial-grade turbine. Equipped with large HEPA (PTFE coasted “TORY” polyester) filter, capable of .3um at min 99.6%. Equipped with a drop-down LONGOPAC system for easy dust disposal. 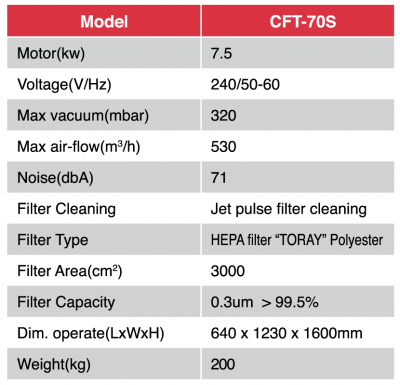 CFT-70S is a HEPA concrete dust extractor with an integrated pre-separator for those big jobs. 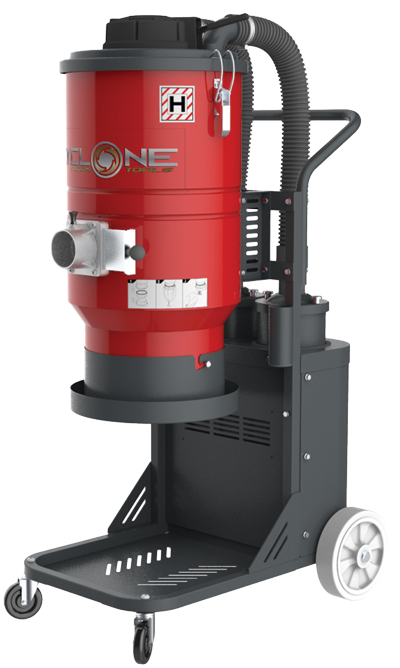 The CFT-70 can be connected to any mid or larger size grinders, scarifies, shot blasters to extract freshly cut, friable concrete dust. Certified HEPA filtration to 99.99% @ 0.3 microns to guarantee that the vacuum exhaust is absolutely dust-free. CFT-70S gives you peace of mind as it uses Schnieder electronic components. Two stage filtration, pre-filter is a CYCLONE separator. Separate more than 95% dust, only a few dust come to the filter, greatly prolong the filter life. 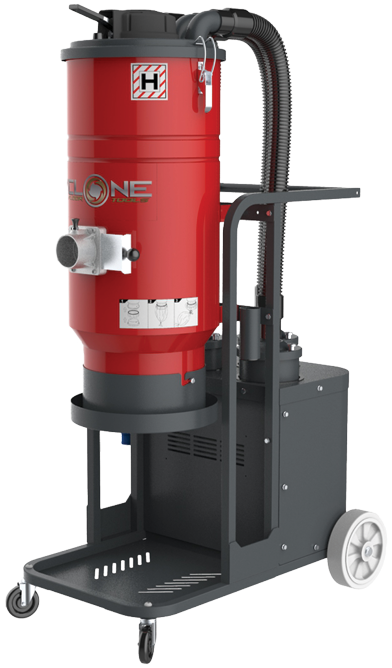 Thanks to the automatic jet pulse filter cleaning, you can keep working without interruptions.The dust extractor build a consistent high suction and large airflow, leaves little dust on the floor. Equipped with Schneider electronic components, for overload, overheating and short circuit protection. Can work 24 hours continuously.